TeenZone were recently sent a sample of BaoCare™’s baobab oil for treating acne and we are big fans. We can’t lie – we were skeptical about using an oil on our skin for acne – but the results are amazing. The oil is light and absorbed quickly. It took about a week for us to notice a difference, but now the skin is less inflamed, red and overall just softer and more elastic. Essentially – try it. Inspired by the abundant riches that come from the baobab tree, EcoProducts has created BaoCare™, a 100% pure and natural skin healing range using the rare baobab oil as its foundation hero ingredient. Baobab oil is a rich amber-gold oil cold-pressed from the small brown seeds found within the fruit pod of the baobab tree. Baobab oil has a unique fatty acid profile with exceptional quantities of Omega 6 and 9 necessary to maintain elasticity, soften and smooth the skin and naturally regenerate new skin cells. Baobab oil is naturally anti-inflammatory helping to sooth inflamed, problem skin. The organic wild harvested Baobab oil in BaoCare™Acne SkinCare provides the necessary hydration to promote healing. 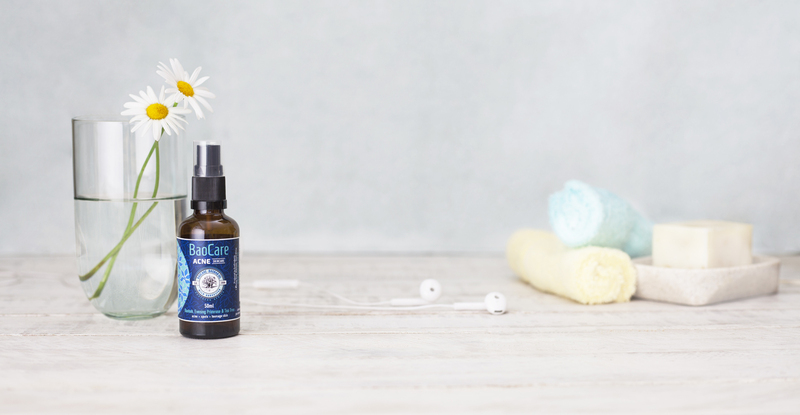 Boosted by Tea Tree oil, Calendula and Evening Primrose oil, this expertly formulated blend is anti-microbial and contains high levels of linoleic acid to help balance sebum production. BaoCare™ Acne SkinCare is free from synthetic chemical ingredients, parabens and mineral oils. It’s a skin care solution that has been meticulously formulated with ingredients best known to be helpful in healing of acne, pimples and teenage problem skin. Linoleic acid is a natural component of sebum and plays a significant role in strengthening the lipid barrier of the epidermis and normalising skin metabolism. Applying it to problem skin can result in improved sebaceous gland function and the prevention of acne formation. Baobab oil has 30% linoleic acid and BaoCare™ has boosted this with Evening Primrose oil which is known for acne treatment and has 75% linoleic acid. Tea tree oil has also been included at specially formulated levels which have proven anti-microbial properties. EcoProducts believes it’s impossible to separate what we create from how and where we create it. That’s why BaoCare™ is as much about the natural skin care solutions they’ve created as the people who help to produce their range and the environment from which they source their raw materials. The certified organic baobab oil is wild-harvested in the Limpopo, the heart of baobab country by EcoProducts, South Africa’s first and only baobab producer. EcoProducts employs mostly women from Venda communities in the area. EcoProducts also runs the Baobab Foundation, which sources funding to support pre-school creches and the Baobab Guardians Program, a baobab tree planting initiative. A Culture of Caring is one of the key premises upon which BaoCare™ has been built, based on the inherent wisdom of the baobab tree itself. The legendary baobab tree can survive harsh, near desert conditions through its ability to conserve water. Unlike most trees, it can regenerate its own damaged bark, much like human skin. The baobab tree gives shelter to numerous species of insects, birds and animals and is regarded by traditional cultures as both a wise, benign presence and a gathering place for community building. Its fruit and leaves are exceptionally nourishing and it’s reputed to live for thousands of years. There’s a natural resonance in a tree celebrated for its longevity, providing oil which keeps our skin supple, healthy and ageless. And just as the baobab is able to thrive in hostile desert conditions, so baobab oil helps us to weather harsh environmental elements which dry out and damage our skin. BaoCare™ taps into the profound wisdom of sourcing our healing solutions from the same environment in which we live: Africa.